Just in time – the last painting of my 2018 painting project finished yesterday afternoon. And as it is the last day of the year today it is a good time to reflect back on my art story through 2018. It seems a very long time since I wrote about my plans for the year in a blog post on January 1st. Some of them came to fruition, some didn’t, and some are still in progress. 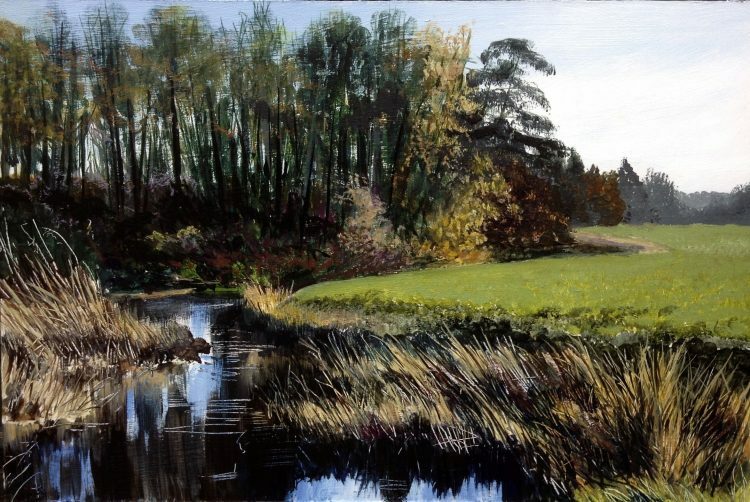 Big Painting Project: Four Seasons on the Stour This was a great project to do! I really enjoyed following the Stour upriver from the estuary, and I discovered some lovely places which I had never been to before. The paintings were almost all difficult – but that was good because it really stretched me. By the time I got to Stratford St Mary and Higham I felt I was painting pictures which involved a complexity which even a few months before I would not have attempted. At present Wrabness, Cattawade and Stratford St Mary have sold, and Flatford I is spoken for, and from Boxted Mill to Long Melford have not been exhibited anywhere yet. Landlines: This idea has resulted in seven paintings so far, and some of them have been my most successful I think. So far Landlines 3: Track and Landlines 5: Channels have both sold. The Ridgeway: I spent another wonderful week this year walking The Ridgeway, staying in Ashampstead in West Berkshire this time. I have a heap of drawings and photos which still need to be turned into paintings – come back tomorrow for news on this one! Fingringhoe Wick Books: I had these published with Blurb online publishers in January and have so far sold 18 copies. I also had cards printed of Fingringhoe Wick April, June, August, July, October and November from Point Graphic printers in Maldon which have been selling well. All Saint’s Arts Festival: We had a lovely time organising and running this, and it was very successful for most of the artists involved, and much enjoyed by all the visitors. I personally was well pleased as I sold well over a thousand pounds worth of paintings, cards and books. Drypoint: I was planning on trying this during the year. I got as far as buying a starter kit with everything I need from Intaglio Printmakers in London – but have not yet got started! This is a definite for next year! Exhibitions: These were all enjoyable – and variable in success. The Haylett’s Gallery and All Saint’s Arts Festival were very successful, Geedon Gallery was – for the first time ever – a complete wash-out (but my paintings were hung on the stairs and I really don’t think anyone looks at the pictures on the stairs which are so steep and narrow), Artspace in Woodbridge was not very successful in sales for me, but was a good learning experience and I made a lot of good contacts. Taking part in the this exhibition and sharing the organisation has also resulted in me hiring The Sentinel Gallery in Wivenhoe for a week in 2019 which I’m not sure I would have thought to doing without that experience. My Open Studios weekends in September were fun and successful with lots of lovely visitors – more than ever! – and interesting conversations and sales. So altogether, a very good and enjoyable year. Call back tomorrow to read all about my plans for 2019 – and I’ve got LOTS!